Alias is a clean-sheet design that focuses on the performance and design elements that make flying, and even learning to fly, fun. The first mission objective was durability. Alias is built around a unique molded-composite frame that is combined with clever high-tech construction to make it extremely light and virtually indestructible. Your flying fun goes on and on without worrying about breakage from crash damage. The next mission was performance. Fun always comes from having more power so Alias’ motors have 50% more power than standard motors, and when combined with the lightweight design and high-tech materials, Alias is lightning quick and ultra-responsive. A completely new flight control system was developed that provides unmatched 6-axis stability that works in the background without impacting performance and speed. It acts like a virtual spring that snaps Alias back to level controlled flight no matter what situation you find yourself in. New pilots can fly faster and perform aerobatic maneuvers sooner than they ever thought possible with Alias’ unique flight control system. Form follows function with Alias’ fun and purposeful style. Superior visibility is enhanced by special high intensity LED optics that clearly define the shape of Alias and can be seen from above or below. The lights are so bright and colorful that Alias makes a whole new world of night flight possible. Special colors for the blades and the canopy were formulated to look sharp and aid visibility from a distance. The elevated rotors prevent tangles when landing in grass. The sleek styling of the frame actually adds strength while minimizing weight. Alias’ ergonomic transmitter design was not overlooked as part of the total flying experience. It takes a cue from game controller design that’s made for hours of comfortable use. Even the thumb pads on the gimbals contribute to the more comfortable, relaxed flying position. The precision gimbals are precisely tuned to the flight software to give the pilot a one-to-one connected feel with the Alias. Alias immediately builds pilot confidence as it responds precisely to the transmitter inputs. Alias is uniquely engineered to satisfy the needs of both new pilots who want to experience the fun of flying and experienced pilots who want a fun and relaxing way to sharpen their skills. Thoughtful design touches abound including the telemetry powered battery fuel gauge that provides visual and audible alerts when it’s time to recharge the flight battery. Technology is utilized the right way to enhance performance, maximize durability, increase flight time, and make Alias easy to fly. Alias model 6608 comes fully assembled and ready-to-fly in one of 4 fun colors. 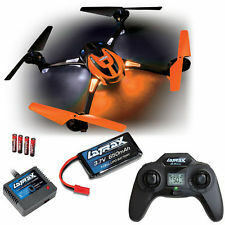 Included are a 650mAh LiPo flight battery, a high-output USB fast charger, and four AAA batteries for the transmitter.